Why stay at just another hotel? 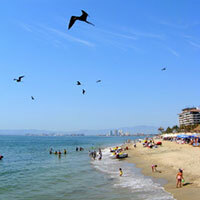 Experience Puerto Vallarta for a weekend, a week – or more – from your own home-base. As the proud owner of this beautiful vacation rental I know that no hotel could compare with the comfort and freedom of staying in this privately-owned condo. Whether your trip to this gorgeous area is for a family vacation, honeymoon (or a second honeymoon) or a quiet, peaceful get-away, vacation living is definitely better from the privacy of this vacation-rental-by-owner. This by-owner condo rental offers everything to make this vacation the best-ever! The full Puerto Vallarta experience is conveniently located right outside the condo: Los Muertos beach, shopping, dining out, the charm of Viejo Vallarta, exciting nightlife and the Malecón are within easy walking distance. Let us share our vacation home with you — we know you’ll love it as much as we do. To see the condo’s availability for the upcoming season, please view our calendar. For reservation information, contact us today.